To get a real sense of old time Alaska, travel like the original pioneers did-by horse-drawn wagon. Climb into Black Diamond’s Covered Wagon Adventure and you’ll be in for a trip through time. While guides fill you in on the area’s history and natural treasurer, you’ll be pulled through the Alaskan tundra with the mountains of nearby Denali National Park hovering overhead. Join us for an exciting, yet relaxing, journey into the wilds of Alaska. 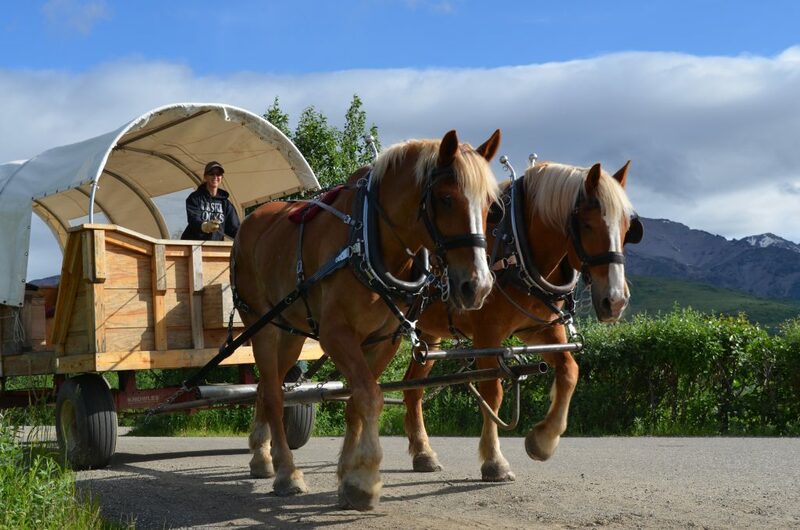 Our custom built Covered Wagon Ride is pulled by two beautiful Draft horses. Your tour begins at your hotel where our guide and driver pick you up. You will travel north to a beautiful mountain lake with panoramic mountain views! From here you have a chance to stretch your legs before getting onto the wagon. The relaxing ride out to our pavilion takes about 45 minutes. Once you arrive, enjoy a relaxing meal freshly prepared with only the finest ingredients and served by our staff family style! After you have finished your feast you have a chance to meet the horses that brought you to this remote location, take a picture, and then head back to civilization via your covered wagon. Your horse guide and your entertainer along with two wonderful horses will take you on a photographic adventure back along the North side of the Denali National Park Boundary. Learn about the history of this Mining area as you pass through the wilderness. Your guide will share with you local folklore, facts, and more! You also pass a few real and rustic old Alaskan Cabins and have a chance to see how some Alaskans still live! Don’t miss this total wilderness ride that has something to offer the entire family!